Do you wear eye and ear protection (Part V)? You live in Shasta or Tehama County - Why don’t you have a Concealed Weapon Permit? My prior articles covered the three Fundamental Rules of Firearm Safety (i.e., Always keep the gun pointed in a safe direction; Always keep your finger off the trigger until ready to shoot; and Always keep the firearm unloaded until ready to use). Also, we covered other gun safety rules (i.e., Know your target and what is beyond; Know how to use the gun safely; Be sure your gun is safe to operate, and Use only the correct ammunition for your gun.). (Rule source: NRA). Today, we cover the additional Gun Safety Rule - Wear eye and ear protection as appropriate. Also, we address - why don’t you have a CCW? You have only one set of eyes and ears. Protect them. Just as with using certain types of equipment, if you hear ringing in your ears, you are causing hearing damage. If you think it looks cool to wear that cowboy hat (without eye and ear protection) while shooting your six-shooter, better think again. A gunshot can damage unprotected ears. Further, hot gas and debris are emitted during the discharge of a firearm which can result in eye injury. Thus, wear eye protection and ear protection. Also, if any spectators or shooting buddies are present during live fire, have them also wear eye and ear protection. Of course, if you must use a firearm for immediate self defense, you won’t have time to seek out eye and ear protection. Common sense tells us that much. But, when practicing with your firearm, be safe and smart. Also, have you considered applying for a Concealed Weapons Permit? Why not? Do you feel that you and your family are exempt from potential criminal attack? There is a very high probability that your view will change if you are the victim of an attack. It’s like the spare tire, you never need it until you need it. Possibly you are of the view that as a law abiding American citizen, you don’t need to obtain a permit in order to carry a firearm for self-defense? There are many who agree with you on that last point, including the founding Fathers of this great Nation. BUT, the reality is that if you carry a gun without a permit in California, you can be criminally prosecuted! If you live in those California counties striving to degenerate into members of the 3rd World community, then only the anointed ones who are politically connected can defend their lives. As to normal American citizens, we have a snow balls chance in you know where of obtaining a Concealed Weapons Permit. Your life and right of self-defense are simply irrelevant to the dictates of the 3rd World Power wannabees. Instead you will get a body bag (reserved for the innocent victims of criminal attack), along with a press conference about how terrible it is that people like you are subjected to crimes perpetrated by gangs, etc.... . Your family will be told that they too can dial 911 ( just like you did). In my course, we perform the Tueller Drill (reactionary gap) and you will see how fast your life can evaporate in a contact weapon attack. However, you do live in the North State. In Shasta and Tehama Counties, you have the opportunity to actually obtain a Concealed Weapon Permit. 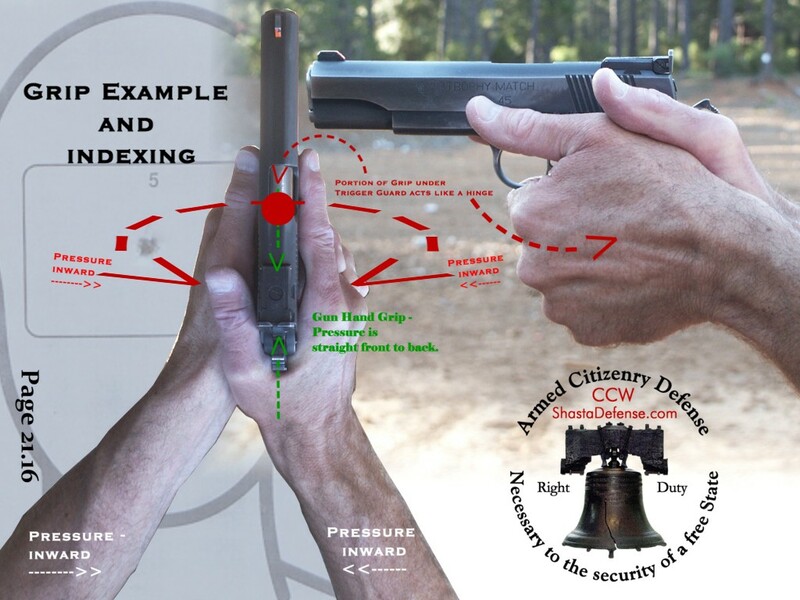 Look at the CCW application and take steps to get the permit! Don’t put you and your family at risk of prosecution for exercising your God given right of self defense because some politically activated prosecutor wants to make an example out of you for being prepared to defend yourself and family. Then, work to get the "law" changed so that it respects your right and duty of self defense. In closing, did you know that the Second Amendment does in fact apply to your state and local government? Here is what a Constitutional law attorney has to say: "For among most contemporary judges, lawyers, and members of the legal intelligentsia, the reach of the Second Amendment passes for a controversial question; however, both the original Constitution and the Second Amendment made abundantly clear that "the right of the people to keep and bear arms" applies to every level of government, without exception, throughout the United States." (Edwin Vieira, Jr. Attorney at Law). Of course, the reality is that not all government officials, including judges, actually follow the Constitution and Bill of Rights, even though they swore an Oath to uphold and defend the same against all enemies, foreign and domestic. We must all take it upon ourselves to learn our American heritage and rights. It is our DUTY to do so. Also, support those in government who support your God given rights as an American. Then, vote those oath breakers out of office who don’t. It’s that simple, but it starts with you!